Last weekend Matt and I had the opportunity to take a last minute trip to Bangkok. With a holiday in India, Matt's birthday, and a good deal due to Thailand's monsoon season, it was a perfect getaway. If you're willing to deal with some short bouts of rain and a little humidity, then traveling during monsoon can save you big bucks. Since this was our second time visiting Bangkok, we were able to enjoy the weekend with no agenda. The first time we went, we crammed as much sightseeing in as possible, and were able to see most of the major attractions. But we still left wanting more. So this time around we were able to wander around and take in all the sights and tastes of the city. 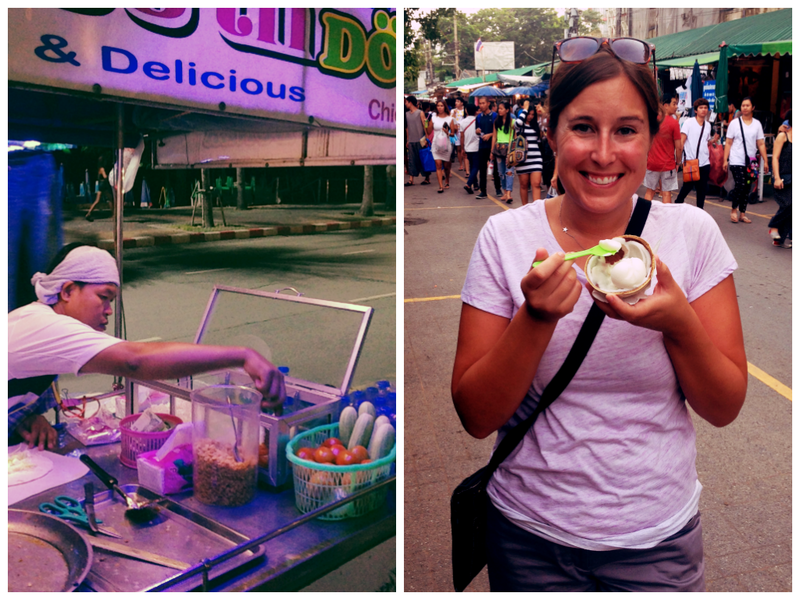 Bangkok for us is like going to Vegas for the weekend if you live in the U.S. It's convenient, and may seem like a crazy, overwhelming place, but coming from India it is quite a respite. And with excellent (and cheap) public transportation, getting anywhere you need to go is easy. 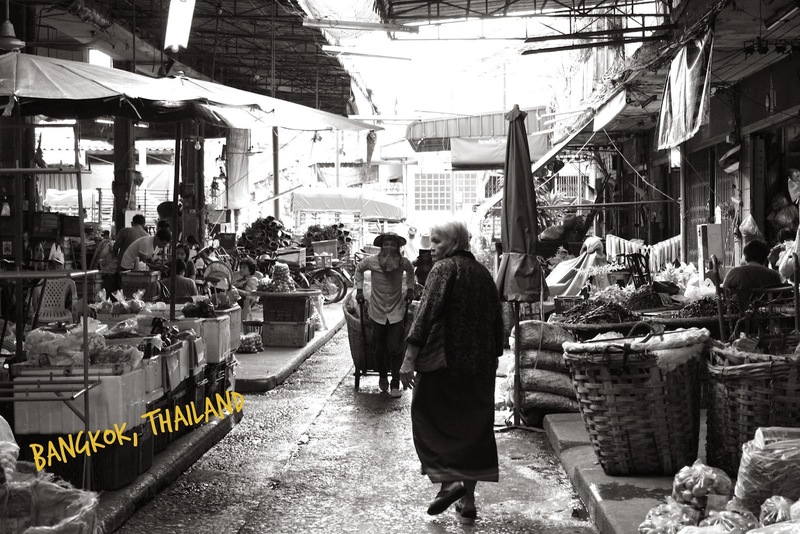 So since this trip for once did not consist of the top ten things to do as listed on TripAdvisor, I will instead share with you some of our favorite finds off the beaten path in Bangkok. We happened upon this flower market fairly accidentally. We got on the water taxi which stops at several docks along the Chao Phraya River. Or at least it's supposed to... for whatever reason this taxi blew past the first four stops despite people clearly wanting to get off at them. We ended up getting off at the first stop the boat actually docked, and wandered towards the flower market. It was a bustling place, filled with family owned stalls of vendors ready to sell orchids. After a short adventure past some chickens and a very ferocious dog, we made our way to the Golden Mount, or Wat Saket. 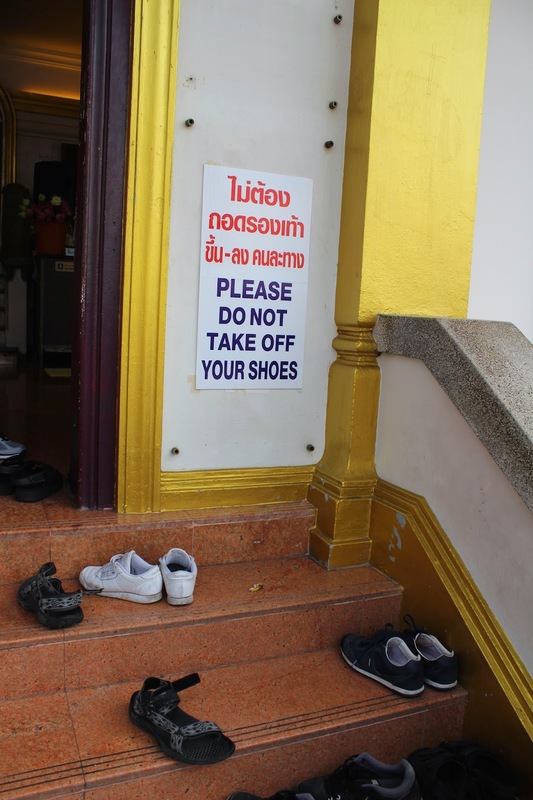 After we walked up an endless number of stairs, we arrived at the Wat entrance, greeted by this interesting sign. We decided to go with the sign, so Matt and I kept our shoes on while everyone else followed the crowd and took their shoes off before entering. Which would you do? The shrine is named after Chao Mae Tumptim, who was a pre-Buddhist tree spirit. Those who worship at this shrine are blessed by him, and these phallic statues are seen as a sign of fertility. The best part of this place was finding it. I followed directions on-line which were surprisingly accurate. It's technically on the grounds of the Swisshotel near the back alley of the parking lot. It was a quick and interesting stop! We decided to take a two hour trip down to Pattaya, and there are simply no words to describe this place. It was a cheap ride for about $3 each in a shared van, with drop off at our hotel. We spent the day relaxing at our hotel with the pool to ourselves (perk of monsoon season) and the evening taking in all the sights of Pattaya. Let's just say that anything and everything you can imagine seeing, you will see on "Walking Street." I was hoping to see bugs in Chinatown, but I was sadly disappointed. 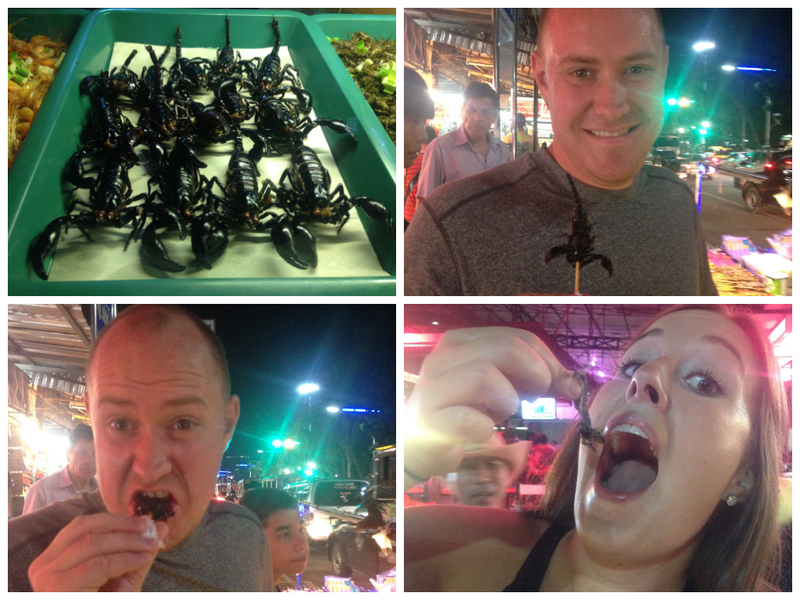 So when we came across a whole cart of critters in Pattaya, we had to give it a try! Matt was just going to eat a scorpion, but the guy cooked a whole bag of bug stew for us, including frogs, crickets, and slugs. I only ate the leg off this frog and one slug...they were so fried it was like eating a potato chip. Matt was far braver and ate the entire scorpion! Now I can say I've eaten a bug, and don't ever need to do that again. One of our favorite things to do on vacation is EAT! We definitely enjoy exploring the various street food options, but we also had to fulfill our craving for beef. Thai Noodle Soup is likely my favorite street food item. I've had it several times, and I'm not ashamed to say I'm pretty picky about it. I have no problem walking past five noodle soup stalls before deciding on one that looks just right. The best part is the price. Some delicious eats can be had for just a dollar. A cheeseburger may not be on the top of your list of things to eat in Thailand, but this was something that really hit the spot. I did lots of research on where to get a good burger, and we ended up at The Firehouse. It was juicy and flavorful, and the fried pickles with ranch were excellent! A Kebab is something I was introduced to in Rome. It actually isn't pieces of meat on a stick like I had always thought. But it's meat, vegetables, and delicious sauces wrapped up in a tortilla or pita. I had kebab twice this trip, and it was filled with chicken, tomatoes, cucumbers, and four different sauces - yum! After my Kebab, I needed something sweet so I had fresh coconut ice cream served in the shell. There were a variety of toppings available, none of which I believe go with ice cream. Corn?! Kidney beans?! Let's not be ridiculous. In my opinion, taco fixin's don't belong on ice cream. Our weekend was a great escape from the hustle and bustle of Jaipur. A few years ago, I never would've thought I'd be able to go to Thailand, let alone go there twice! I'm feeling really lucky to live in a place where a weekend trip can take me to a new country. Your pictures and blog is showing how much you enjoyed in Bangkok. It is no doubt that it is a fabulous place with the multiple tourist attractions. I visited it three months ago with my family. It was our second tour toward to this region. First we explored it last year after thousand islands niagara falls tour. During these both trips we saw its many places such as Temple of Dawn (Wat Arun), Temple of the Emerald Buddha (Wat Phra Kaew), Museum of Contemporary Art, The Grand Palace, Temple of the Golden Buddha (Wat Traimit), The Golden Mount (Wat Saket), Wat Benchamabophit and Lumpini Park. It was a memorable trip of my llife.